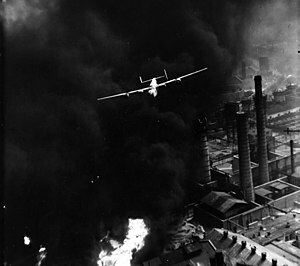 If the first badly bombed cities — Warsaw, Rotterdam, Belgrade, and London — suffered at the hands of the Germans and not the Allies, nonetheless the ruins of German and Japanese cities were the results not of reprisal but of deliberate policy, and bore witness that aerial bombardment of cities and factories has become a recognised part of modern warfare as carried out by all nations. Article 25 of the 1899 and 1907 Hague Conventions on Land Warfare also did not provide a clear guideline on the extent to which civilians may be spared; the same can be held for naval forces. Consequently, cyclical arguments, such as those advanced by Italian general and air power theorist Giulio Douhet, do not appear to violate any of the Convention's provisions.Due to these reasons, the Allies at the Nuremberg and Tokyo Trials never criminalised aerial bombardment of non-military targets and Axis leaders who ordered a similar type of practice were not prosecuted. Chris Jochnick and Roger Normand in their article The Legitimation of Violence 1: A Critical History of the Laws of War explains that: "By leaving out morale bombing and other attacks on civilians unchallenged, the Tribunal conferred legal legitimacy on such practices." ^ Duga, James; Stewart, Carroll. Ploesti. Brassey's. 2002 [26 March 2009]. ISBN 978-1-57488-510-1. ^ Crook, Paul. Chapter 10 "The case against Area Bombing". (编) Peter Hore. Patrick Blackett: Sailor, Scientist, and Socialist. Routledge. 2003: 176. ISBN 0-7146-5317-9. ^ R.J. Rummel. China's Bloody Century: Genocide and Mass Murder Since 1900. Transaction Publishers. 31 August 2007. ^ United States Strategic Bombing Survey, established by the Secretary of War on 3 November 1944, pursuant to a directive from the late President Roosevelt, 30 September 1945. Anesi.com. [November 2015]. ^ J.K. Galbraith, "The Affluent Society", chapter 12 "The Illusion of National Security", first published 1958. Galbraith was a director of the U.S. Strategic Bombing Survey. ^ Gómez, Javier Guisández. The Law of Air Warfare. International Review of the Red Cross. 20 June 1998, nº 323: 347–63. ^ Terror from the Sky: The Bombing of German Cities in World War II. Berghahn Books. 2010: 167. ISBN 1-8454-5844-3. ^ 31.0 31.1 31.2 Sir Arthur Harris. Despatch on War Operations: 23rd February 1942 to 8th May 1945. Routledge. November 30, 1995: 44. ISBN 0-7146-4692-X. ^ State Crime: Current Perspectives (Critical Issues in Crime and Society). Rutgers University Press. September 28, 2010: 90. ISBN 0-8135-4901-9.